I would like some way to disappear where people don’t see me anymore at some point. I don’t want to grow old. I never want to look in the mirror and see that. Better than a concert, better than a front row seat, better than a faux-leather red jacket with lots of zippers. Chuh mon!THIS IS IT is Michael Jackson up close and personal – at least as up close and personal as an insulated, world-harried, neurotic, consummate performer could ever hope to be. Some of the best Michael Jackson footage ever released. In this compilation of rehearsal footage from Jackson’s planned 50-date 2010 tour (derailed due to his untimely death), we are not presented with that weird public persona that Jackson obviously loved to cultivate; we see the artist as musician, dancer, songwriter; an auteur with his sequin-gloved fingers in every aspect of this massive production pie. Don’t expect a documentary about the artist’s last days or any kind of tragic retrospective putting a rubber stamp on his legacy; we go into this movie knowing Jackson is not just a legend, but a man who’s presence alone can guarantee that even this disjointed, “unproduced” filmic record (of his REHEARSALS, no less) will generate interest, income and controversy. Kenny Ortega (HIGH SCHOOL MUSICAL series) directs the stage show, and also directs this film, which is simply bare bones rehearsal rehearsal rehearsal. And that’s why it’s so damn cool. Musicians will enjoy the privilege of seeing the final stages of Jackson’s empty arena dress rehearsal, complete with raw, undoctored audio, production crew directives, and Jackson creating a few cues and overseeing some final arrangements like a regular bandguy. While all you “other people” will get off on just seeing Jackson. Doing anything. There is no narration to tell us who this is, where we are (Staples Center, Los Angeles), what we’re doing (final rehearsals for London’s O2 Arena) or even what year it is (mid 2009). By film’s end, you’d never know the subject of the film is no longer with us. The final text simply reads: Michael Jackson / King of Pop / Love is forever. No crash-cuts, or 1-second edits – this clear, steady footage is taken from two or three cameras shooting Behind-The-Scenes and production footage for study purposes, and much of it would have ended up as supplementary DVD material. The production is nearing stage-ready; most songs are performed in their entirety. Wanna Be Startin’ Somethin,’ Jam, Smooth Criminal, They Don’t Care About Us, Thriller, I Just Can’t Stop Loving You, Beat It, I Want You Back, Black or White, Billie Jean, and more. But – surprisingly – no moonwalk. Jackson’s dancing is, of course, a thriller, and he more than matches the backing dancers literally half his age. Though 50, there is no sign of exhaustion or complaining (at least, none is shown), and all his little botty boys ostentatiously applaud him every time they are standing floorside and watching him solo. Little obsequious street-cred wiggas, with their Hammer pants and backwards-caps. Jackson graciously appends “with love” to every correction he makes to his band, dancers or crew. And you know what? He means it. Granted, this doc might intentionally omit scenes of him berating anyone or cracking under stress, but a person this controversial has enough detractors to expose footage like that if it existed. So we presume it doesn’t. And he is really singing. Over the four other backing vocalists that admittedly provide sturdy support, that’s definitely Jackson’s live voice. When he backs off the mic or misses words, we hear everything. 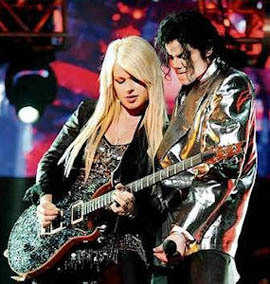 Michael watches Orianthi stroking that neck and DOESN’T fantasize about where her hands could be. The Way You Make Me Feel – and Jackson’s major shortcoming glares at us from the stage. He’s no ladies’ man. His interaction with the female dancer struttin’ the stage is cringeworthy; looks like “the way she makes him feel” is like a Just Friend, instead of a dangerous lover. He looks way more comfortable when surrounded by buff wiggas. A short video montage of the Jackson 5 during I’ll Be There brings a tear, especially when we see the crew on the floor all raising their arms and swaying in unison. All in fun, but they would never have realized they would be the last “audience” to do so. Jackson gives a heartfelt “I love you” to each of his brothers after that song. Earth Song brings its contradictory environmental message, which is part of the theme of the tour – Share The Love and Save The Trees. The backing video shows a young girl walking through a jungle, enveloping herself in its wonder, but nowhere in any jungle is there a natural condition where a girl wearing those synthetics and using that styling mousse would be amidst that jungle. Maybe a naked ebony-skinned native, but this Disney caricature would be eaten by a jaguar in two minutes. You know where you are? You’re in the jungle, baby. You’re gonna die! 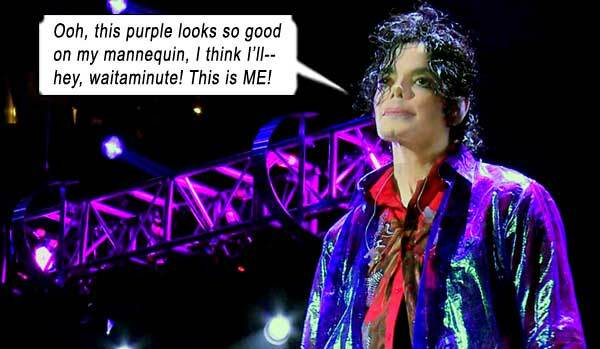 By the way, Mr. Jackson, your semi-trailers and airplanes transporting this massive stage show can’t be too good for the jungle. And if it was all jungle out there, well, just where would you perform your songs constructed around million dollar music videos? The film does wind down towards the end. They don’t go out with a bang, but with the introspective Man in the Mirror. We could speculate forever on why THIS IS IT was released, and each reason is a part of the whole; part exploitation, part capitalism, part legacy, part recoup, part tribute, part time capsule… That gag about all those people out of work is no gag. Insurance clauses would have started flying across lawyers’ desks since the King of Pop’s death in June 2009. And behind closed doors where the only king is the bottom line, there is no talk of insensitivity when recouping money for the army of personnel who blocked out a whole year to work with the Jackson entourage, or securing future rights and plotting release dates for a backlog of unreleased dead man’s material that will keep corporations solvent for years to come. The puling fans shouting “too soon” and “disrespect” actually think their opinion matters in these decisions. Well, as long as they keep buying the stuff, the arbiters of Jackson’s merchandise will keep lying to them that it does. The King of Pop is dead. Long Live the King. Chuh mon! 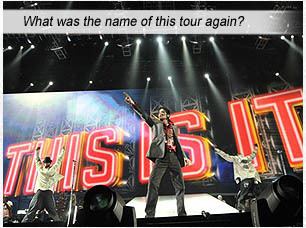 aka: MICHAEL JACKSON’S THIS IS IT. Starring: Michael Jackson, Kenny Ortega, Travis Payne, Michael Bearden, Jonathan Moffett, Orianthi Panagaris, Tommy Organ, Alex Al, Mo Pleasure, Judith Hill, Darryl Phinnessee, Ken Stacey.